Get to Know The CMU PINK Reps | Grand Central Magazine | Your Campus. Your Story. CMU Pink reps Julia Webster (left) and Alexx Delzer (right). Photo by Nicole Basler. 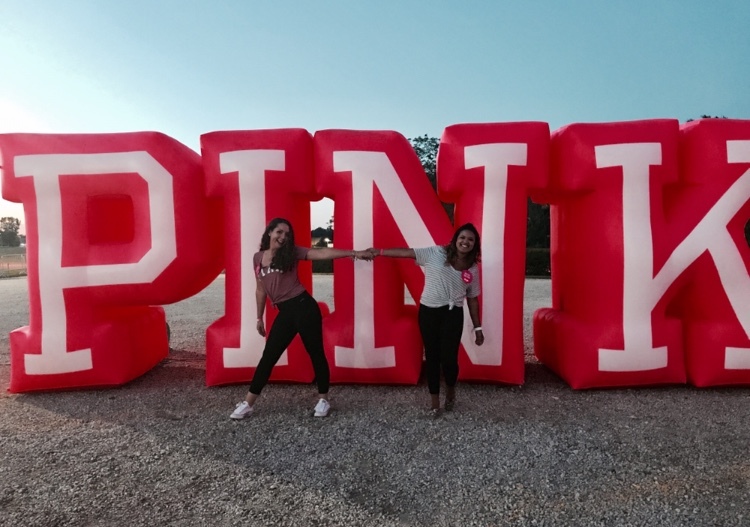 Victoria Secret’s PINK has two campus representatives at Central Michigan University. The PINK Rep are Julia Webster, junior from Canton, Michigan, who is majoring in fashion merchandising and double minoring in leadership and marketing. Alexx Delzer, also a junior from Midland, Michigan, is double majoring in English and school health for secondary education. CMU Pink Reps Julia Webster (left) and Alexx Delzer (right). Photo by Julia Webster. Being a fashion merchandising major, Webster has learned so much about real world experience with her time being a PINK Rep. She has learned how to be a better leader, how to be organized and plan events, and most importantly all of the amazing things Victoria’s Secret PINK does. “I am being immersed into the fashion industry even more than I have ever expected. I am getting real life experience that you can’t learn by reading a textbook.” -CMU Julia Webster, PINK Rep.
Webster’s favorite part of being a PINK Rep is seeing the smiles and joy on girls faces at their events. 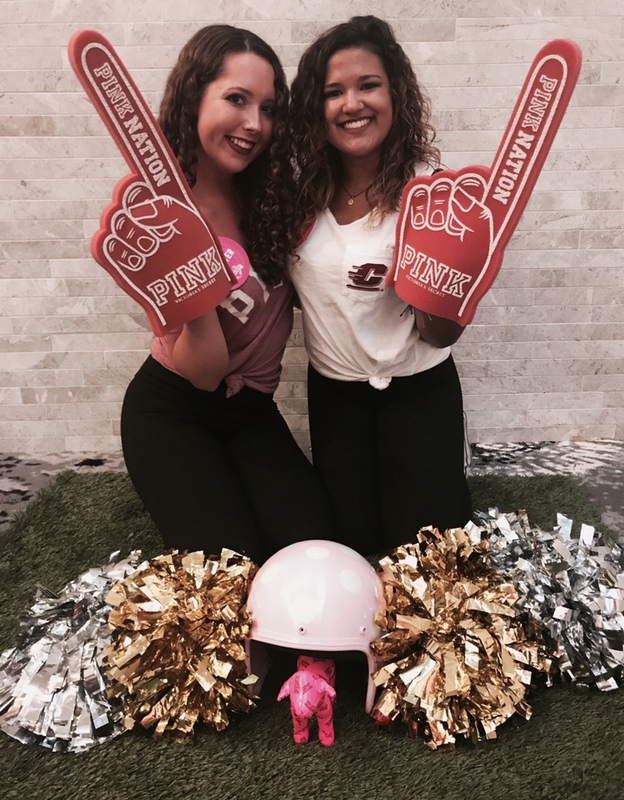 Getting girls involved on campus is one of the main focuses for the PINK Rep Program, having fun while giving away merchandise is the best part, according to Webster. Delzer had always been interested in being a PINK Campus Rep ever since she met a PINK Rep at the Midland Victoria’s Secret store and she encouraged her to apply. She saw how much fun they had planning events and knew she wanted to do something just like them. She was the on Campus Team her freshman and sophomore year at CMU, and this year she is an official PINK Rep for CMU. Studying education at CMU has taught Delzer to use what she’s learned in her major in a variety of ways to help her. She realized that education is actually all about marketing, being a teacher she would need to market herself to the parents, students and the administration everyday. Having a chance to practice these skills with a brand is perfect preparation going forward with her career in education. Also, Delzer loves that she has the chance to educate girls on campus about Victoria’s Secret PINK. 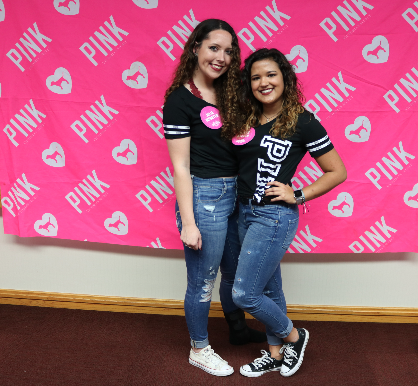 As PINK Reps, Webster and Delzer’s goals are to bring brand awareness to campus, and most importantly to make girls feel good about themselves. One of their favorite parts of being a PINK Rep was when they met the gorgeous Victoria Secret Angel Zuri Tibby, who walked in this years Victoria Secret Fashion Show. The biggest event for the year that the PINK Reps get to plan the annual Victoria Secret Fashion Show. Planning includes; putting in space and food requests, going through the countless shipments they receive and partnering with other campus brand reps. When Webster and Delzer aren’t planning for the Victoria Secret Fashion Show, they are creating ideas for other on campus events and working on marketing. For those interested in applying to be a Pink rep next year, The PINK Reps recommend that you come to events, get involved, follow CMU Pink on social media and message them with any event ideas. Separator image Posted in Campus Fashion, Style, Style & Beauty and tagged with alexx delzer, Elizabeth Reyna-Hernandez, julia webster, pink, pink cmu, pink reps, Student Lifestyle, victoria's secret, victorias Secret Pink.